This week’s WWE Monday Night Raw was a mixed bag, with mismatched tag team matches, a very hot women’s angle followed by a lame resolution, and a fantastic main event. Here is a look at this week’s WWE Raw results and grades. In a follow up from last week’s angle where Kurt Angle and Baron Corbin came out to the ring to set up the Raw main event for WWE Extreme Rules — a multi-man match for the number one contender’s spot for Brock Lesnar’s WWE Universal Championship. Just like last week, Roman Reigns interrupted him before he could make the announcement and then Bobby Lashley interrupted as well. Plus, just like last week, Lashley and Reigns played a “whose is bigger” battle, with Reigns calling Lashley a quitter who left the WWE and Lashley calling Reigns a loser who couldn’t get it done for three years now. After that, Kurt Angle announced that the multi-man match is now off because of Brock Lesnar’s contract — or something like that, which makes no sense. Then The Revival comes out and wants a rematch of last week’s tag match. 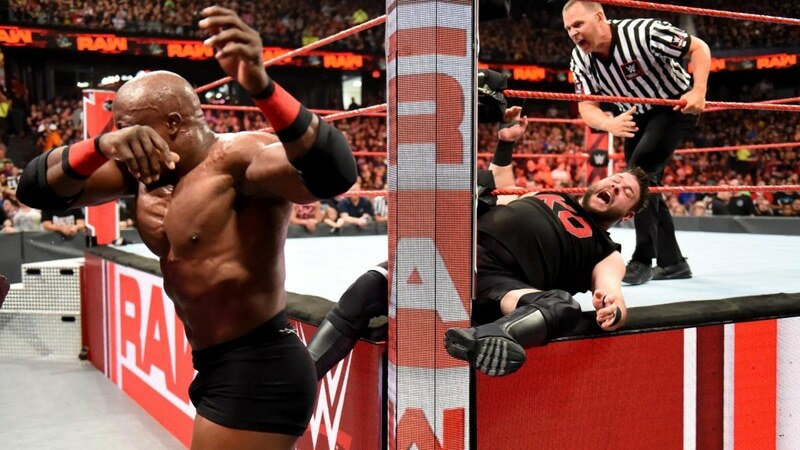 The promo between Lashley and Reigns was fine but the entire angle of dropping the match made no sense at all and was a precursor to the entire night of WWE Raw. Roman Reigns and Bobby Lashley did the exact same thing that they did last week by trying to one-up each other. Last week, Lashley blind tagged in and hit the spear to win. This week, Reigns blind tagged in and then was pinned by The Revival. Lashley then left and shook his head, saying he told Roman so. It was a surprising end to a lackluster match. Roman Reigns losing was the shock, and the rivalry between Reigns and Lashley continues. On the positive side, The Revival picked up a big win — finally. Before the match, the Deleter of Worlds cut a bizarre promo and then the B-Team cut another promo mocking them (which is still great watching Bo Dallas imitate his real-life brother Bray Wyatt). The match was pretty bad. Matt tried to hit a suplex from the buckle on Axel but fell and ate the pin. After the match, the two teams faced off before Matt started cheering for them for a great win. Matt Hardy is hilarious and the excitement by the B-Team is fun, but the match was terrible. The Authors of Pain came up to the main roster a while back and then the WWE forgot they existed. This was a quick squash. Before the match, the AOP bullied some backstage worker and Titus Worldwide admonished them for it. After this match, the AOP started beating up the jobbers and Titus Worldwide ran in for the save. This was a squash match and was exactly what it needed to be. The problem is that no one cares about Titus Worldwide and the audience was quiet during the post-match save. Alexa Bliss and Mickie James came out and Bliss bragged about being the champion, getting Ronda Rousey suspended and sending Nia Jax to therapy. That brought out Natalya, who said that Kurt Angle gave her a match against Bliss right now. Natalya then brought out Nia Jax to offset Mickie James. Mickie interfered at one point but Natalya kicked out. This caused Nia to then interfere and Natalya locked in the sharpshooter and won. This was a match and it looks like Alexa Bliss might be fighting Natalya at Extreme Rules instead of Nia Jax. Kurt Angle was mad that Bayley and Sasha Banks are not friends anymore and said they are valuable to Raw so they have to be friends (this makes ZERO sense). The match happened and Sasha Banks lost when Ruby Riott pinned her. Then, after the match, Bayley attacked Sasha Banks and the crowd went absolutely nuts. Bayley destroyed Sasha and the crowd was loving every minute of it. By the time she was done, Banks was dead and the fans loved Bayley more than they ever have since her call-up. After this molten hot angle and the huge crowd reaction, Kurt Angle told Bayley it was uncalled for and demanded that she goes to therapy next week because she has to be friends with Sasha Banks. Otherwise, she is fired. The WWE got a hugely surprising reaction tonight when Bayley went nuts and destroyed Sasha Banks. This was equivalent to Ronda Rousey destroying Alexa Bliss last week on the crowd happiness scale. So, WWE followed up with a stupid therapy angle because when men attack each other, it is wrestling, but when women do it, they need therapy. This was supposed to be a rematch from last week. Mojo Rawley beat No Way Jose easily so they get another go? Mojo came out with a mic and said that the congo line at ringside did not deserve to make that walk to the ring. He verbally abused a guy dressed like a cheeseburger and said he will never be anything and then said he won’t fight Jose again. When Jose confronted him, Mojo punched him and walked out. This was actually a pretty good angle and might be the best that Mojo Rawley has ever been on the mic. It went a little long, but if Mojo can improve in the ring, he might have something here. This was the second mismatched partner’s match after Bayley and Sasha Banks were forced to team up. 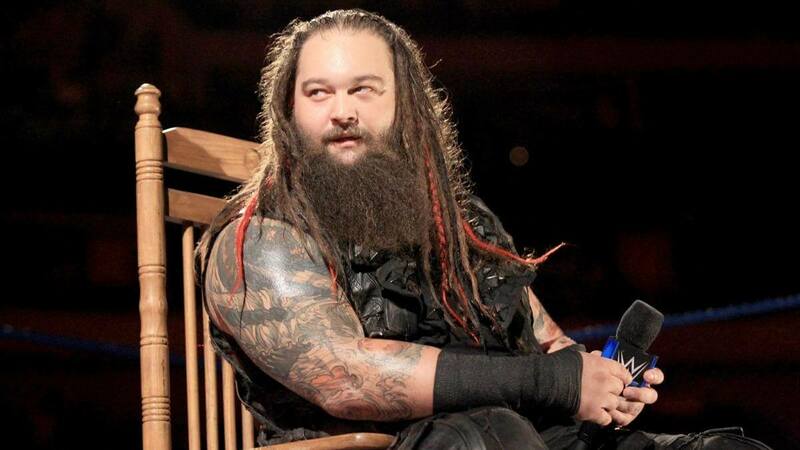 In this case, Braun Strowman asked to team with Kevin Owens — who he said he had treated unfairly. He then suggested that Finn Balor and Baron Corbin team up, which Angle thought was funny and agreed to. Shockingly, Braun Strowman and Kevin Owens worked together in the match, although Kevin was scared to death of Braun the entire time. Braun even got Kevin to do his running tackle, although he only hit Finn with it and Corbin was there to block the second one. The match ended up count out, with Braun and Kevin winning. However, after the win, Kevin tried to shake Braun’s hand, saw the look on his face, and ran away with Strowman giving chase. Backstage, Owens hid in a room while Strowman ran around looking for him. Finally, when Owens tried to leave, he couldn’t find his car. Strowman showed up and said the car is over there and Owens car was upside down and smoking. This was a fun match. Kevin Owens was hilarious as he was scared to death of Strowman the entire match. Finn Balor and Baron Corbin can’t get along, and Strowman keeps on winning — and messing with KO. This is a rematch from last week where Ziggler won the title. The match was long and fantastic. Both men worked their butts off and turned in great performances. Late in the match, Drew McIntyre interfered. the referee didn’t see it but kicked him out of ringside anyway. The end came when Rollins hit a huge superplex followed by the Falcon Arrow and went for the pin. He got a 2 count when McIntrye ran down, pulled the referee out and then attacked Rollins. They then beat the heck out of Rollins until Roman Reigns ran in to save his former Shield partner. The best part of the post-match was that Drew McIntyre refused to back down from Roman Reigns, but ended up knocked out of the ring anyway. This was a great match and one of the best main events on WWE Raw in a long time. The end protected both men, with Ziggler the heel who needed help to win and Rollins not taking the second pinfall. It reunited The Shield but not Reigns is involved in two angles (one with Lashley and one with Rollins), so Extreme Rules just got really confusing.